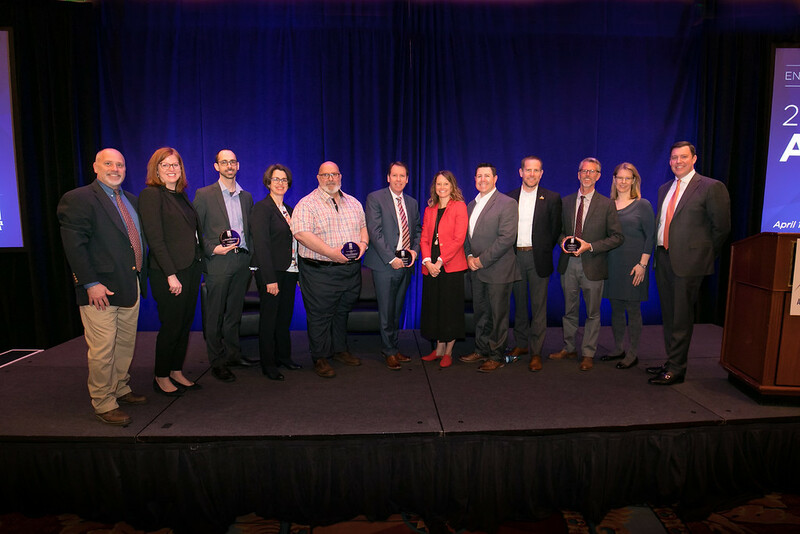 SALT LAKE CITY – Airports Council International – North America (ACI-NA), the trade association representing commercial service airports in the United States and Canada, today recognized the winners of the 2019 ACI-NA Environmental Achievement Awards at the Airports@Work Conference in Salt Lake City, UT. The 2019 award recipients are Aéroports de Montréal, Billy Bishop Toronto City Airport, Québec City Jean Lesage International Airport, and San Francisco International Airport for their work to protect and preserve the environment through their programs, initiatives, and projects. San Diego International Airport was recognized with honorable mention. Established by the ACI-NA Environmental Affairs Committee, the annual Environmental Achievement Awards acknowledge the hard work and achievements of ACI-NA members by promoting awareness more broadly within the airport community, the general public and regulators of the many notable and innovative efforts being undertaken by environmental professionals at airports. ACI-NA annually awards up to four awards recognizing outstanding achievement in the categories of Environmental Management, Environmental Mitigation, Outreach, Education and Community Involvement, and Innovative/Special Projects. Winners in each category were selected by a panel of judges who reviewed the project’s environmental benefits, innovation, effective implementation, widespread applicability and cost-effectiveness. Judges for the 2019 awards were Jim Crites, President of Jim Crites, LLC; Ian Jopson, Head of Environmental & Community Affairs at UK NATS; and Patrick Magnotta, Assistant Manager of Airport Planning & Environmental Division at the Federal Aviation Administration. Environmental Management Award Category: San Francisco International Airport was selected as the winner for their “Zero Net Energy Airfield Operations Facility.” In January 2019, the airport marked a new milestone in sustainability and a major step towards its campus-wide Strategic Plan goal of zero net energy: SFO’s LEED Gold-rated Airfield Operations Facility (AOF) recorded zero net energy usage for the previous 12 months. By using 100% on-site renewable energy, the building avoids using over 160 MWh annually from the grid. Through this project, the airport sets an example for what the judges note should become standard practices across industry. Outreach, Education and Community Involvement Award Category: Aéroports de Montréal was selected for the outreach award for their “Noise Barrier” project. The airport staff undertook this project as a way to make a noise barrier made of natural elements that meets noise reduction requirements while beautifying the area. The extra effort to build the noise barrier that is more visually pleasing than a standard concrete wall received positive feedback from the local community. The community outreach efforts in this project showed good stewardship that the judges believe will likely be invaluable during future efforts of the airport working with the community. Special/Innovative Projects Award Category: Billy Bishop Toronto City Airport was recognized as the winner for their “Airfield Rehabilitation” project. The airport took a holistic approach towards this project, which over three years included the reconstruction of aging runways and taxiways, a complete LED lighting retrofit, and the construction of a Ground Run-up Enclosure (GRE) designed to dampen the noise associated with high-power aircraft engine ground run-up operations. Innovative elements of the project included a barging operation to move materials, in order to reduce vehicle noise and emissions, and special efforts to be good neighbors during the night-time work such as reconfiguring construction activities and traffic to minimize reversing equipment and vehicles and the associated use of back-up alarms. Mitigation Award Category: Québec City Jean Lesage International Airport won the award for the energy efficiencies gained in their new terminal. The Quebec City Airport has been growing, and has invested $500 million in the last 15 years to increase capacity and maintain infrastructure. The expansion has resulted in a doubling of the terminal size. In an effort to not see their energy consumption usage increase correspondingly, the airport implemented measures such as geothermal energy, heat recovery systems, heat wheels and variable speed motors, which resulted in an impressive 56% energy consumption reduction in 2018 as compared to the reference year of 2016. Honorable Mention: An honorable mention is awarded to San Diego International Airport for their Terminal 2 Parking Plaza that demonstrated the core aspects of sustainability. The project goes beyond the expected energy efficiency measures, and included social aspects such as strong local and small business participation. Operational features include advanced parking guidance technology, and a below-ground rainwater storage system that captures rainwater that falls on the structure, which is then used in the adjacent Central Utility Plant to help manage air temperatures in the terminals. The judges are recognizing this project for honorable mention in both the Mitigation, as well as the Innovative and Special projects categories.